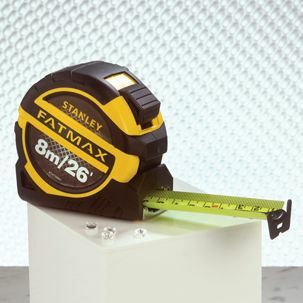 The Stanley FatMax Pro-Tape has an extra wide 32mm blade and a 3 rivet end hook, that is 40% stronger than a 2 rivet hook construction. Its cushion grip provides sturdy, slip-resistant hold. Mylar® coated blade, up to 10 times more resistant to abrasion than normal lacquered blades. 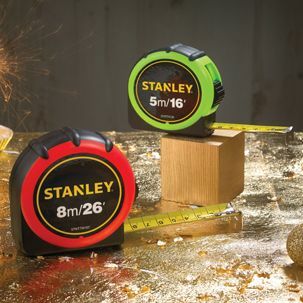 With blade armour coating on the first 100mm reduces the risk of breaking the tape by 95%. Has a huge standout of 3.35m, for easy one person measuring and specially designed hook grabs on side, top or bottom for versatility.